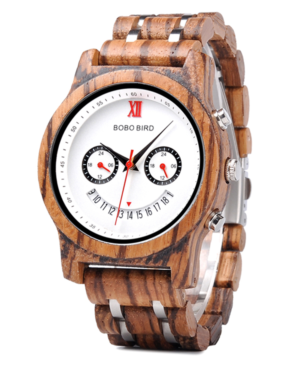 This Men's Bamboo Wood Vintage Quartz Watch is best described as “classic, striking and sophisticated”. The contrast of the subtle green against the stainless steel three hand movement and markers creates an incredible clarity to the face. 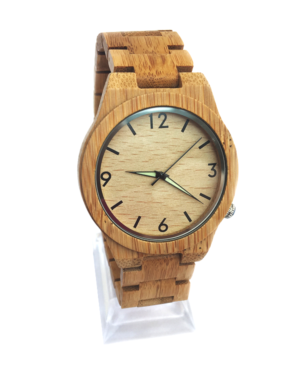 This attractive mens bamboo wood watch is hand crafted from natural bamboo. 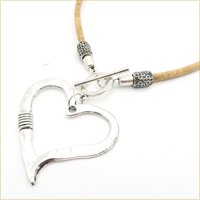 The design is elegantly simple, yet sophisticated. The first thing that strikes you is the immense clarity of the face and the striking effect of the stainless steel edging against the wood. The three hand movement is adorned with luminescent coating on two of the markers. 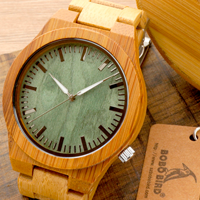 This attractive men’s bamboo wood watch with leather strap will inject a hint of rustic style to any casual outfit. 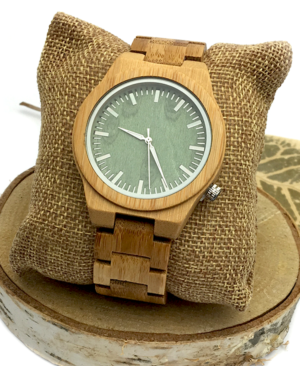 The subtle green hue of the face against the wonderful variations in the wood’s grain creates a striking contrast. 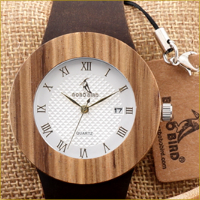 This gorgeous mens watch oozes rustic charm with a combination of neutral colours, natural materials and textures. 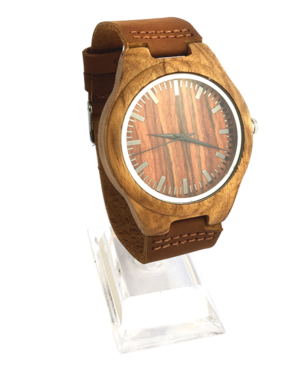 This Men’s Zebrawood Quartz Watch has a striking clarity to the face. 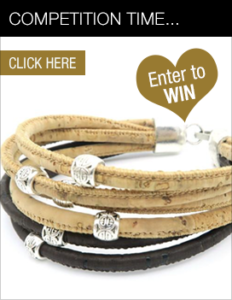 It features a fabulous zebrawood surround and bracelet style, adjustable strap. 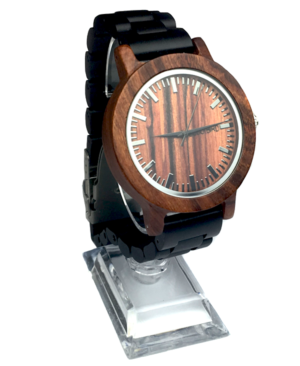 The contrast between the rich, darker tones of the zebra wood against the paler shade of the wooden face is an attractive and eye catching feature of this stylish men’s wooden watch. 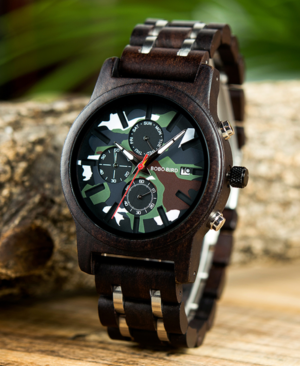 This Mens Luxury Ebony Wood Watch is the epitome of sophistication. 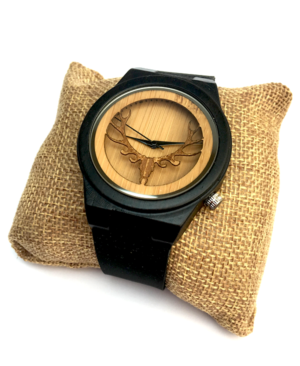 The luxurious, rich dark tones of the ebony wood are perfectly highlighted by the use of high gloss metal that links the bracelet style strap. 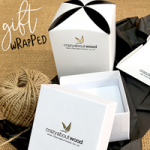 There’s a stylish, slim look and feel to the bracelet strap, which is adjustable in size by simply removing links using the tool provided. 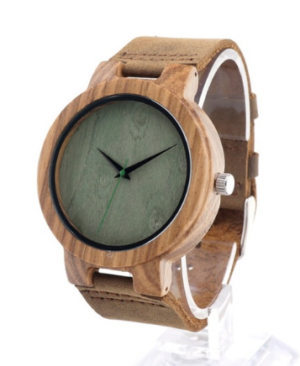 This men's luxury wooden quartz watch is one of our favourite watches in this year’s collection! 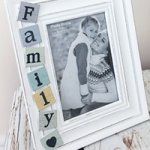 Its classic design gives it a wide appeal and yet its chunky proportions give it that extra stylish edge. 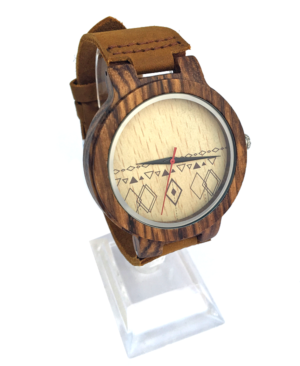 This stylish men’s watch is the epitome of casual chic! 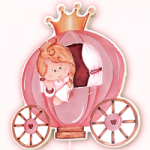 Hand crafted from natural materials, it features a fabulous deer design within the face. 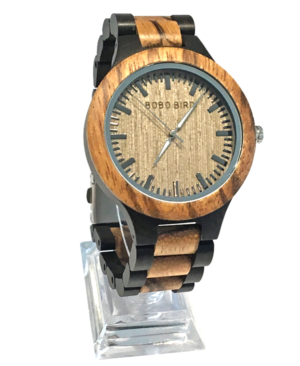 This Mens Zebrawood and Ebony Quartz Watch is an incredibly striking addition to our 2018 collection. 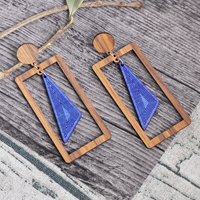 The hazel tones of the natural wood face against the rustic charm of the fabulous zebrawood surround create a stunning combination. 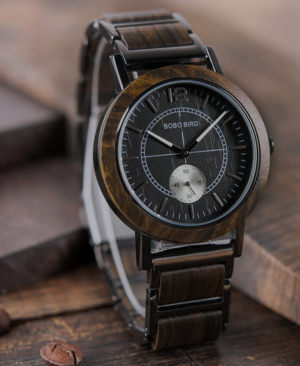 The stainless steel markers on the face give it clarity and the three-hand movement features luminescent markers – meaning this is a watch that is easy to read both day and night. 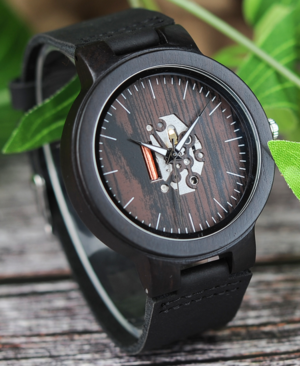 This fabulous Men’s Blackwood Watch with Black Leather Strap & Skeleton Face is incredibly stylish and sure to attract many admirers! The moving parts at the centre of the face are revealed to provide a striking and fascinating dimension to this unusual, partial skeleton timepiece.